Stelter: Is the Roy Moore race a referendum on the media? Is Moore's campaign against the media working? "The media" is not on the ballot in Tuesday's special election in Alabama. That's obvious, yes, but it bears repeating because Roy Moore has been trying to run against the national news media for the past month. "A vote for me is a vote against the no-good media" is the message. It echoes President Trump's appeal to his base -- and it could be a preview of a midterm election strategy for Republicans. Voters "are not going to be told what to do by the lynch mob media," Moore's newly-hired spokeswoman Janet Porter told CNN's Anderson Cooper last week. The implication is that last month's campaign-changing Washington Post story was a hit job. Many Alabamians see it differently. Even Richard Shelby, the state's senior senator, said the allegations of sexual misconduct by Moore -- first leveled in a Post story on November 9 -- were "enough" to say "I can't vote for Roy Moore." Moore has repeatedly denied allegations of sexual misconduct. Even before the story came out, Moore called it a "smear campaign." A convenient leak to Breitbart News sought to pre-empt the Post, but had little effect. Moore's defenders assailed the Post and the national media writ large, even as local journalists began to corroborate the women's accounts and interview other accusers. "This tactic of actively disparaging the press -- and refusing almost all interviews -- has surely found some success with Alabamians who believe the 'liberal media elite' is seeking to control their lives," Michelle Holmes, the VP of content for AL.com, told CNNMoney. "At the same time, there is a flip side: as local on-the-ground media, we've seen levels of support for our journalism unprecedented in the modern era from Alabamians aghast at Moore's candidacy," she said. AL.com and the state's three biggest newspapers are operated by the Alabama Media Group, a unit of Advance Publications. The papers ran a front page editorial last month denouncing Moore and endorsing his Democratic opponent Doug Jones. On the campaign trail, Jones has pointed out Moore's refusal to debate and reluctance to give interviews to journalists. At one point shortly after Thanksgiving, the tensions briefly became physical, when Fox News said that two Moore campaign staffers manhandled two photojournalists. 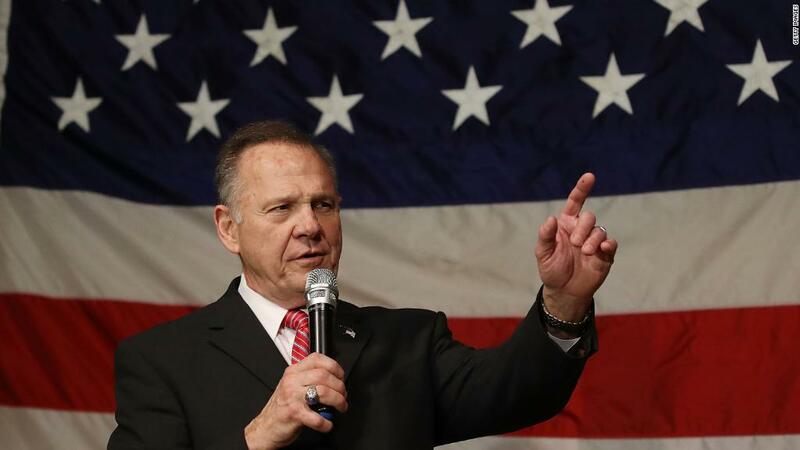 "The Moore team is using the race as a referendum against the media, Washington, 'The Establishment,' etcetera," said CNN commentator and former RNC communications director Doug Heye. He said that recent "high profile mistakes" by national news organizations have made it "easier and easier for a campaign to dismiss reporting it doesn't like as 'fake news.'" Anna Claire Vollers, a reporter for the Alabama Media Group, hears that "fake" insult on a regular basis. "An entire year of 'fake news' accusations has taken its toll here in Alabama, just like it has nationally," Vollers said. "The Republican base who love Trump and Moore are particularly suspicious of the mainstream media, I've found. They don't see themselves accurately reflected there, and I think there is some truth to that. But I've also seen readers, including Republicans, vehemently defend my work." She recalled interviewing two women who self-identified as Republicans "express how they wish more people would pay attention to deeply-sourced, quality journalism, and cited the Washington Post stories on Roy Moore's accusers as a prime example." The effects of Moore's persistent media bashing remain to be seen. But it's clear that some of his supporters have embraced this approach and argued that journalists are out to sink Moore's Senate candidacy. It "has become a battle between Roy Moore and you guys" (meaning the media) "and he's going to win," Dale Jackson, a conservative radio host in Huntsville, said on CNN's "Reliable Sources." Elaina Plott, a staff writer for Washingtonian magazine who has been covering the race closely, said on the program that a Moore victory will show "every single Republican candidate" that "the media is a credible opponent."